Photographer Meryl McMaster examines an autobiographical space between here and there. Meryl McMaster: Wingeds Call (version 1), 2015. 24 x 36 inches. With work appearing in a host of national and international exhibitions this summer and fall, 2015 has become an important year for Ottawa-based artist Meryl McMaster. 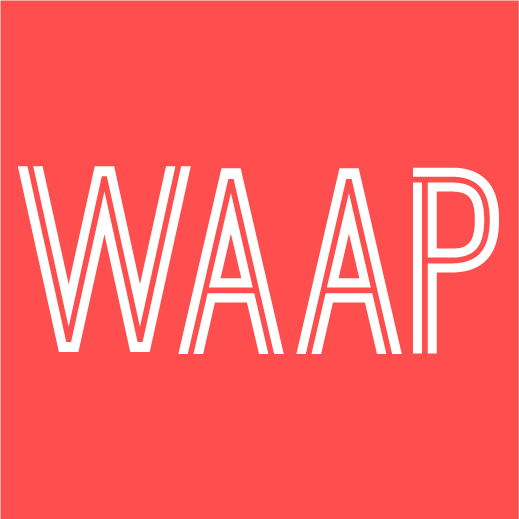 A graduate of the Ontario College of Art and Design University (OCADU), her work engages themes of identity, ancestry, culture and history through photography and the use of props. McMaster’s Aboriginal/Euro-Canadian heritage is also an important factor in analyzing colonialism’s continuing influence on cultural meaning in Canada. Her recent work stresses the transmigration and exchange between two cultural identities. In this sense, it is autobiographical project that investigates the liminal space between here and there. McMaster‘s new body of work, Wanderings, is currently on view at the Museum of Contemporary Native Arts in Santa Fe, New Mexico, with the same show now on in Toronto at Katzman Contemporary. Concurrently, a group show at the National Museum of the American Indian in New York features work from the Second Self (2010) series. And, her work appears in the exhibition Identity: Art Inspired by the Great Lakes at the Lieutenant Governor of Ontario’s Legislative Building, Queen’s Park, Toronto. This fall, she is participating in the Canadian Residency in Detroit. Writer and Magenta contributor Matthew Ryan Smith corresponded with McMaster this summer. 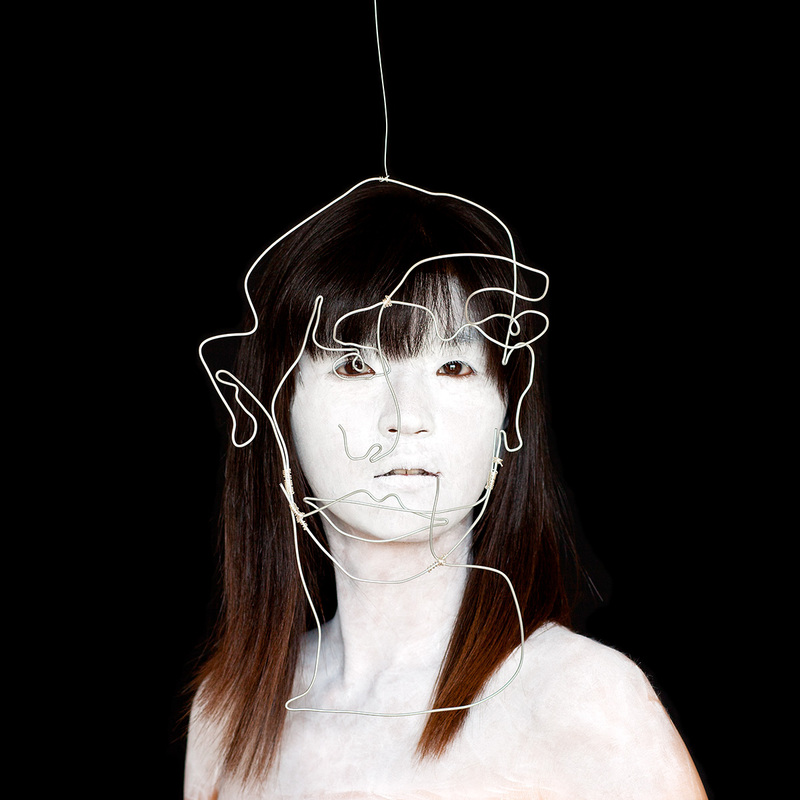 Meryl McMaster: Jin (2010), from the Second Self series. 36 x 36 inches. Matthew Ryan Smith (MRS): How has your Indigenous and Euro-Canadian identity contributed to your art-making? 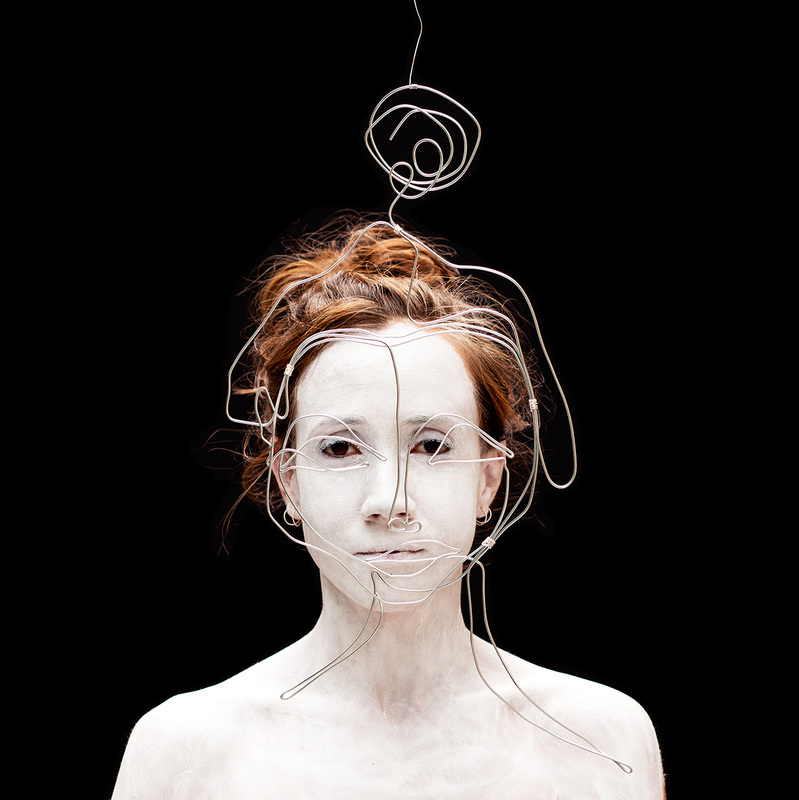 Meryl McMaster (MM): My heritage is something that has always preoccupied my thoughts. When it comes to my art, I have naturally gravitated toward speaking to what I experience or know or what fascinates me. Many of the challenging ideas that I try to portray relating to my heritage don’t always have answers and are difficult to express, but it’s how I express myself, and better understand others and myself. MRS: In the Ancestral (2008-2010) series, you’ve superimposed 19th Century images onto yourself and your father in your studio. Could you talk about the idea of heritage in this body of work? MM: The Ancestral series was my first photographic exploration of the challenging feelings I had around how First Peoples heritage and culture were portrayed through questionable stereotypes in the media and art. These stereotypes are images that I grew up seeing, and I began questioning if I fit into these narrow representations. These difficult feelings are following me into adulthood, and I wanted to reclaim these images and give them a new voice. I started with appropriating the photographs of Edward S. Curtis and Will Soule, and the paintings of George Catlin. These three men could be considered guilty of contributing to the questionable stereotypes of Aboriginal Peoples through their misrepresenting us as a “dying race” in their images. When I look at these historical women and men in this contemporary context, it makes me think about my own ancestors and heritage, and the legacy and traditions they have left behind for future generations to carry forward. In this new context, they are stepping through me into the present and are coming alive in a new way. 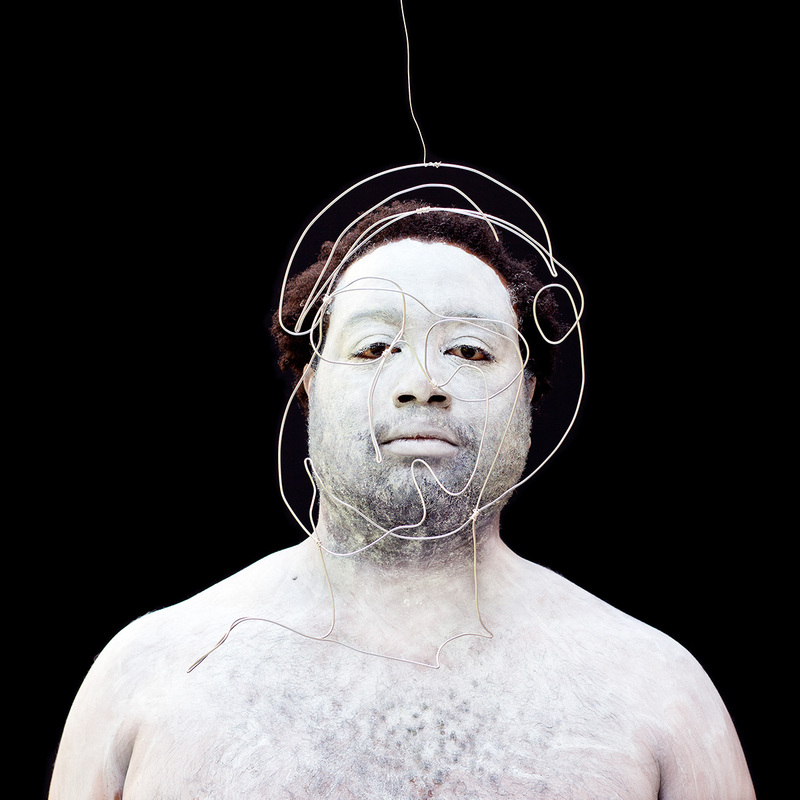 Meryl McMaster: Anthony (2010) from the Second Self series. 36 x 36 inches. MRS: A more recent work, In-Between Worlds (2013-2015), involves fantastical (self) portraits that bridge cultural identities. I’m curious to know how this project materialized. MM: I began this series in my final year at University. At this point, I was starting to explore making props and costumes that I integrated into my photographs. The spark for this series started with wanting to re-explore experiences and feelings from my remote camping excursions. On these challenging adventures, all aspects of yourself are put out for examination, and this helps to make your personal identity more transparent. During and after these trips, the process of self-discovery is the inherent progression and, for myself especially, I thought a lot about my cultural identity. This body of work was where I wanted to bring together my experiences in nature, which was a major catalyst in my life, and the ideas of personal identity, which consumed my thoughts. MRS: I’m also wondering about the role of portraiture in your work. MM: I have always been interested in portraiture in art since I was young, both the technical exploration of a subject and the conceptual ideas behind it. Doing a portrait of someone is very personal and I love trying to discover the true self within a depiction. But, I struggle with finding that at times. Within my work, I have focused on portraiture and self-portraiture, as I’m curious to explore ideas of how we construct our sense of self. Using and transforming the body to help look at these themes is what I’m interested in at the moment. Meryl McMaster: Pia (2010), from the Second Self series. 36 x 36 inches. MRS: How does your lived experience play into your work; in other words, do you see you work as autobiographical? MM: My lived experience definitely plays a role in my work and, in some ways, I do consider my work to be autobiographical. I don’t write in a diary, but my images are like a visual diary. I usually start a project by exploring ideas that relate to questions I ask of myself and experiences I have gone through. I also try to broaden the ideas and imagery so the work is accessible to everyone. The viewer can start to wonder about the work in relation to themselves and question the world in new ways that they may have not thought about before. MRS: Props play a prominent role in your work. For example, in Murmur (2013), you’re enveloped in a flutter of paper starlings. What do props offer you that other visual devices don’t? MM: I’ve always been interested in exploring different media within art, especially sculpture. I have always loved going to theatre and dance performances, and seeing the costumes and sets. At OCADU, we had to select classes outside of our major and I always gravitated toward sculpture classes. When I dream of ideas they always consist of more than scenery but also have a layering of different elements and construction. Towards the end of my time at school I was realizing that I wasn’t happy with the work I was creating. I felt like I could push myself by experimenting with building my own props and costumes. Engaging with different media in my work allows me to create the surreal imagery that I dream of. I am also drawn to the resulting aesthetic and to the creative opportunities it leads me to. 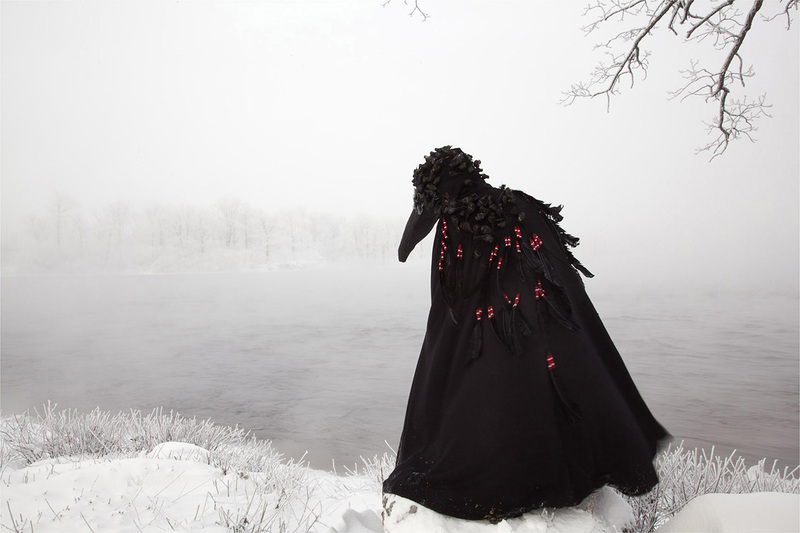 Meryl McMaster: Wingeds Calling (version 2), 2015. 24 x 36 inches. MRS: Some of your works, including Aphoristic Currents (2013) and Wingeds Calling Variation (2015), contain surrealistic elements in that they’re otherworldly dreamscapes. Is this a fair assessment? Is there an element of the surreal in your work? MM: Yes, creating surreal imagery is part of my current aesthetic. I am usually drawn to that kind of work, as well. My ideas come to me with a dreamlike sense and this feeling, I hope, allows the viewer to become lost within their own thoughts and transported out of ordinary life. MRS: Do you see yourself as staying with photography as your principle medium or are you interested in moving out of photography at some point? MM: I’m not sure in which direction my work will go next. I can see doing something other than photography, but I don’t want to make any predictions. MRS: How do you approach the concept of beauty? Do you consider your work beautiful? Do you seek to evoke beauty? MM: I think being a perfectionist makes me think of all aspects of what the final image will look like and, even though I don’t go into a project concentrated on making a beautiful image per se, I still think of the qualities that will make for a thought-provoking and pleasing visual experience. Form, colour, shape and gesture are always in my thoughts when building an image. 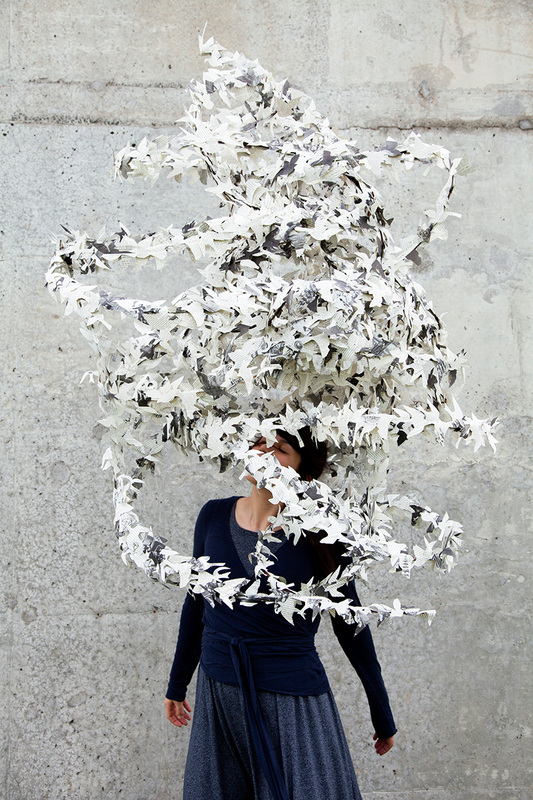 Meryl McMaster: Murmur # 2 (2013). 90 x 60 inches. MRS: Whose work are you following right now? Whose work are you drawn to? MM: I could go on and on! Robin Rhode, Blue McRight, Drew Mosley, Marc Giai-Miniet, Nadia Myre, Nick Cave, Marie Watt, Kate McMillan, Iris Häussler, Li Hongbo, Robert and Shana Parkeharrison, William Kentridge and the dancer Akram Khan, just to name a few. MRS: What or whom are you reading? MM: I have several books on the go, but don’t be deceived – I’m a slow reader. I’m reading A Field Guide to Getting Lost by Rebecca Solnit, The Old Ways: A Journey on Foot by Robert Macfarlane, Daily Rituals by Mason Currey and Six Drawing Lessons by William Kentridge. MRS: Finally, the last question of the “Proust Questionnaire”: what is your motto? MM: There’s more in you than you think. Meryl McMaster’s work is on view at the National Museum of the American Indian in New York until December 11, 2015, and the Museum of Contemporary Native Arts in Sante Fe, New Mexico under December 31, 2015. In Toronto, a solo show at Katzman Contemporary runs until October 10, 2015 and her work is featured in the exhibition Identity: Art Inspired by the Great Lakes at the Lieutenant Governor of Ontario’s Legislative Building, Queen’s Park until July 2016.